Beautiful Condo right in town on a quiet street. Main floor has living room, kitchen and dining as well as a 1/2 bath. Upstairs has two bedrooms and a full bath. Downstairs has a family room with a sleeper sofa, laundry, bedroom and 3/4 bath (shower, no tub). Nice shared courtyard and a gas grill in back for your use. Satellite TV in Living Room, Family Room and Master Bedroom! This unit is nice. You will find it very comfortable for your base camp! Three day minimum on this property! 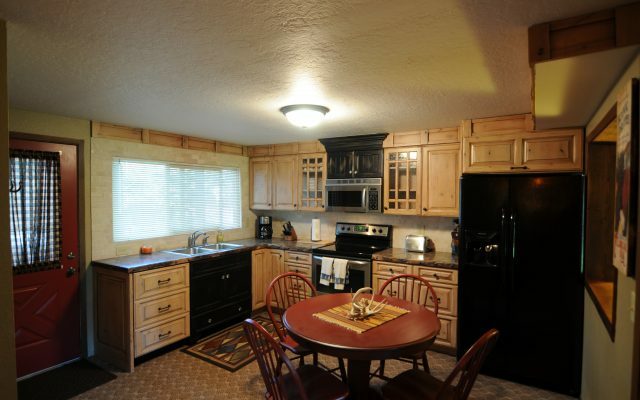 This beautiful home is close to downtown West Yellowstone and only blocks from Yellowstone National Park. Tile and carpet flooring, Corian countertops, tile shower and large jetted tub are just a few of the amenities for your use. Kitchen is fully stocked including a wine refrigerator. 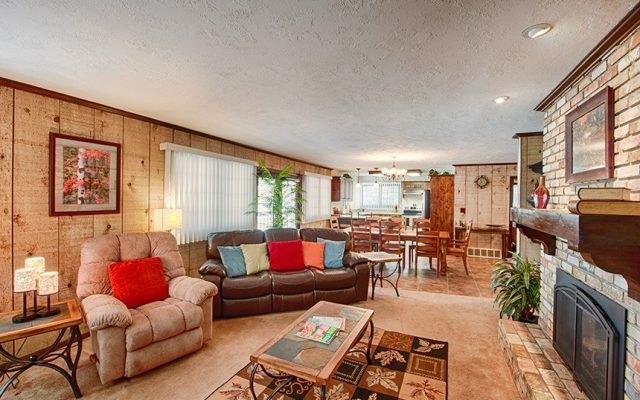 Gas fireplace, satellite TV, 55″ flatscreen, DVD and Wi-Fi. Phone service w/ free local calls. There is a large deck overlooking the street w/gas BBQ grill and outdoor furniture. The leather furniture, large dining room table, plush bedrooms and extravagant bathrooms will make you feel like your home. Just minutes from the best fishing in the world! Madison, Gallatin, Firehole, Yellowstone and Henry’s Fork rivers are all close. Hebgen, Henry’s and Yellowstone Lakes too! Summer or winter this is an outdoor paradise – Park the car or snowmobiles in the 2-car garage. Take off your wet waders or boots and put them on the automatic air dryers before you even go inside. This has it all. Call now to reserve your time in heaven! This home is rented with a 3-day minimum! A shorter period will be considered if time is available. WELCOME TO THE LAND OF BIG SKY, BIG MOUNTAINS AND BIG DREAMS! Our knowledge of the area is our greatest asset. This is an outdoor recreational dreamland. Hunting, fishing, hiking, camping in the summer and skiing, snowmobiling and snowshoeing are just a taste of the activities you will find here at the West gate to Yellowstone National Park. Big Sky Ski and Summer Resort is just 45 miles to the north. There are too numerous blue ribbon streams, rivers and lakes to mention within a short drive. Give us a call. We are sure you will like what you find! © 2019 Yellowstone Realty. All Rights Reserved.